Posted by TransitChuckG on Mon Feb 11 13:54:09 2019, in response to Chicago -Pink train -gap-out, posted by TransitChuckG on Sun Feb 10 18:43:12 2019. 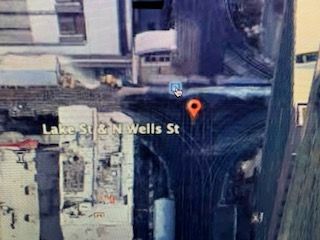 I "think" this the intersection where the gap-out happened, Lake & Wells. Big radius curves, probably produced large areas of no third rail, plus whatever the shoe to shoe spacing was on the car, and ,bingo, we have a gap -out! The posters on Facebook said the operator was probably going too slowly through that intersection.